An entire video devoted to the songs of Ralph Stanley! Learn 7 songs, including 'Man of Constant Sorrow' (two versions in D & G positions), 'Little Maggie,' 'Clinch Mountain Backstep,' 'Daybreak in Dixie,' 'Riding That Midnight Train' and 'How Mountain Girls Can Love.' All taught the Murphy Method way, note by note without tab. 136 min. 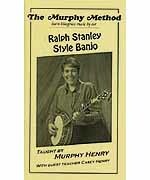 This look at Ralph Stanley's pioneering banjo style begins with the first tunes he learned from his mother in the old-time clawhammer technique and progresses through the three-finger bluegrass picking he helped make famous. 90-MINUTE DVD INCLUDES TAB LEVEL 2/3.